CHARLES FARRAR BROWN[E]. 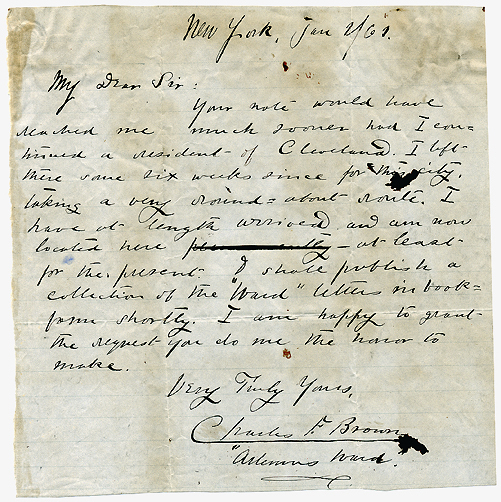 AUTOGRAPH LETTER DOUBLE-SIGNED "Charles F. Brown" and "'Artemus Ward.'" Written at age twenty-six to an unnamed gentleman. New York, January 2, 1861. TOGETHER WITH two photographs and an autograph card, described further below. Approx. 17 X 17 cm. (6¾ inches). One page on light blue writing paper; verso blank. Old mounting traces on verso; old folds strong. Medium area toning or light dampstaining. Two ink smudges (original; one at the end of a line separating the two signatures but scarcely touching any but one final letter). tinued a resident of Cleveland. I left there some six weeks since for this city, taking a very round=about route. I have at length arrived, and am now located here pr+++++++++lly – at least for the present, & shall publish a collection of the "Ward" letters in book= form shortly. I am happy to grant the request you do me the honor to make. The eradicated word in the text would have been too long to read, "presently." It was likely some humorous play on terms which Ward immediately reconsidered as too flippant, and marked out. 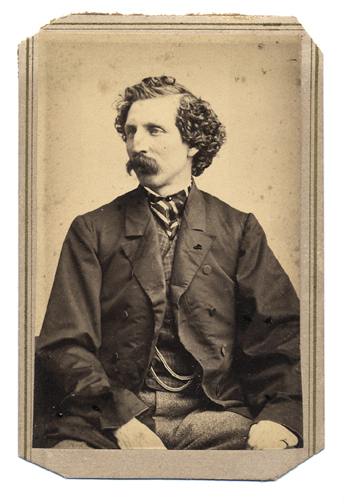 Charles Farrar BROWNE (April 26, 1834 – March 6, 1867) was patronized eagerly from coast to coast in his writings and stand-up comedy "lecture" performances. During a tour of the West in 1863-64, he befriended and inspired the somewhat younger Samuel Clemens (as yet a relative unknown), and then nearly died of a fever in Salt Lake City where admiring residents nursed him back to health. 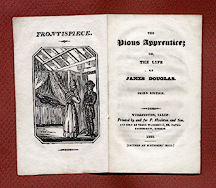 Thenceforth, his principal topics and entertainments centered around his experience among the Mormons, whom he caricatured fondly to full houses, and in large publication runs of his various books. Ward was enjoyed by Abraham Lincoln and applauded in crowded halls across the nation. He was ultimately praised and courted by sophisticated readers and audiences in London, where he gave his final performance on January 23, 1867, dying soon afterward before reaching his thirty-third birthday. For a more detailed overview of Browne's life, see the biographical article in the Dictionary of American Biography III:162-64, nicely written by the celebrated Canadian humorist and author Stephen Leacock. ALBUMEN CARTE-DE-VISITE PHOTOGRAPH of Browne, the mount reading on verso, "Published by E. & H. T. Anthony, 501 Broadway, New York, Manufacturers of the best Photographic Albums." No date, but early 1860s? Approx. 8 X 5½ cm. on somewhat larger mount. Three-quarter image, seated. A thin scratch line crosses the cheek, and there is considerable light mottling to the background, yet a reasonably attractive image. Roughly contemporaneous with the letter; Browne's lean visage appears younger than a slightly more "healthy" studio view taken in Boston illustrated in my Mormon List 67 (2011). ILLUSTRATED at left, and in enlarged detail above. 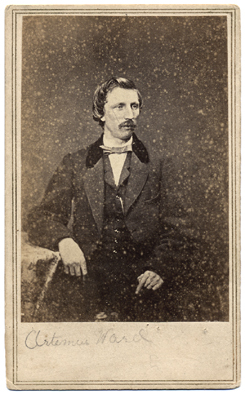 ALBUMEN CARTE-DE-VISITE PHOTOGRAPH of Browne, the mount reading on verso, "Published by E. & H. T. Anthony, 501 Broadway, New York, From Photographic Negative in Brady's National Portrait Gallery." No date, but 1864-66. 8½ X 5¼ cm. on slightly larger mount. The mount is clipped at the four corners (without affecting the photographic print) and bears remnants of mounting on verso. Moderate background discoloration, yet a good image with pleasing dark contrasts. Seated half-length, in fine attire. Ward's hair is heavily curled, showing that this image was taken no earlier than 1864, when he began curling his hair following a devastating illness in Salt Lake City. 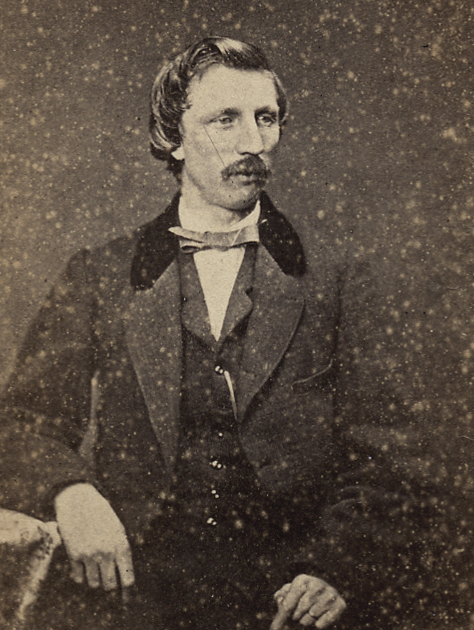 By late 1866, Ward's appearance had become more frail and emaciated than in the present image. AUTOGRAPH CARD DOUBLE-SIGNED: Faithfully yours, Charles F. Browne, "A. Ward"
5 X 9 cm. on a piece of heavy writing paper. Toned but very good; verso blank. 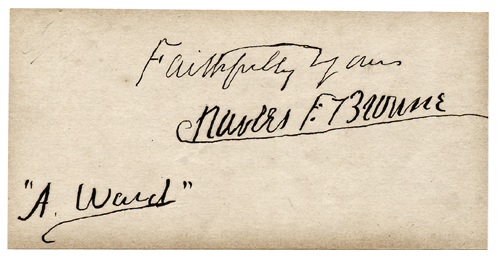 Perhaps clipped from a larger autograph album page. No date, but 1860s, after Brown[e] had added the letter e to the end of his name.
. . . Well, here I am at last. I arrived at four o'clock Tuesday morning [January 1, 1861] and went to bed. Got up at one and went up-town. Couldn't see anybody and felt blue. Went to bed early. Got up this morning and went to Vanity Fair office. Good fellows—glad to see me. Talked ten minutes with them and made a permanent engagement at twenty dollars a week as one of the editors of the paper. Mr. Leland is editor-in-chief. First-rate fellow, I judge. I am to be there promptly at ten o'ck A.M. and go away at half past three. . . . I am certainly a lucky cuss. I don't understand it myself, but it is so. Things are new to me here now, and I shall proceed cautiously. But as soon as I get started I will make things whizz, so to speak. I intend to know everybody on Broadway in about six months. I shall withold my book for the present, until the d—d panic subsides. . . . Won't you have this notice published in the Plain Dealer? "CHARLES F. BROWN.—This gentleman, widely known as the former local editor of this paper, has at last reached New York and joined the editorial staff of Vanity Fair!" Lindsley was the first representative from Ontario County, New York to the State Assembly in Albany, 1791. 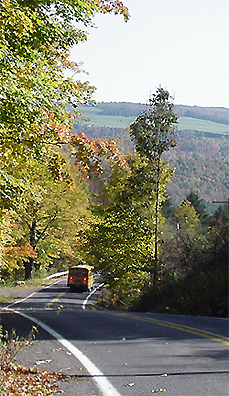 At that time, the massive but thinly-populated county included much of the western portion of the state, essentially the Phelps and Gorham Purchase as conceived in the manuscript at hand. Lindsley got himself elected after arranging for Ontario to be represented in Albany, then by gathering a few early settlers to vote for him, without informing settlers further north in Canandaigua or Geneseo of this new seat in the Assembly. Lindsley appeared in the 1790 census in Township 1, 2nd Range as "Eleazer Lindley Esq." He was one of only six heads of families in the entire township, among whom were also "Samuel Lindley" and "Eleazer Lindley, Jr.". –Orsamus Turner, Phelps & Gorham's Purchase, pp. 172, 348, and 479 (for the census); refer also to its 1794 map by Augustus Porter. MANUSCRIPT DRAFT of "The Petition of us a Number of Freehold Inhabitants of the south part of the County of Ontario State of N York" to ". . . make us a Distinct & Seperate County by the name of _______________ ," begging that . . .
. . . the Boundary of said Intended County may be as follows, Beginning at the 82 Mile stone on the N York & Pennsylvania line. Thence Running North thirty Miles, from thence west to the west boundary of the Preemption - Thence south to the Pennsylvania line from thence East along said line to the place of Begining . . . This defines the approximate extent of present-day Steuben County, which was created from Ontario County on March 18, 1796. Lindley township? (on the Pennsylvania line, south of Painted Post), New York, spring of 1794? The manuscript is comprised of one leaf approx. 9 X 7¾ inches (written on one side), plus a small portion of a conjugate leaf, most of which is torn away and no longer present. The full text of the draft is therefore not present, nor do any names appear as potential signers. 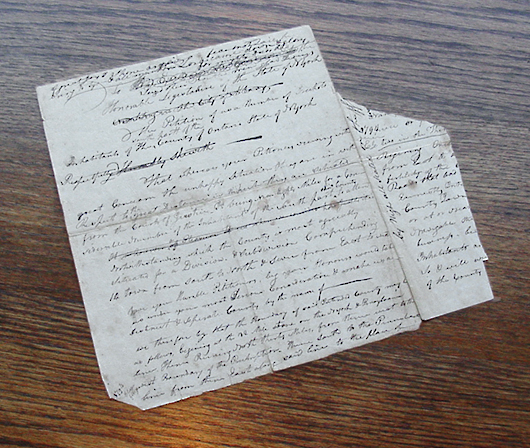 This was clearly used as scratch paper, written on the verso of a page of miscellaneous accounting dated March 14, 1793, showing sundry goods received in exchange for shoemaking. In a small, faint hand, written in one corner, is the apparent signature, "E. Lindsley." In a corner of the manuscript petition draft's lower left margin is a note: "1794 Eleazer [?]uly." At the head of the petition draft are scribbled a few notes relating to the Nativity of Jesus, perhaps for some frontier Christmas observance more than two centuries ago ("of great Joy & shone angels fear not said he bring to you & all mankind Lord came down & glory . . . Seizd their troubled mind glad Tidings," etc.) There is no other dating or name identification on this manuscript. While I have no means of determining who actually wrote the various texts, they are surely related to Eleazer Lindsley and the earliest beginnings of Steuben County, New York. Inasmuch as Eleazer (Sr.) died June 1, 1794, I presume that this document was either written in the spring, or else finished by friends or family near that time. The petitioners give their reasons for the hopeful county division . 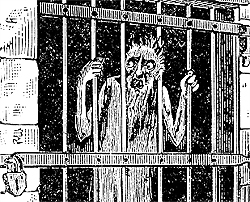 . .
viewing with great concern the unhappy situation they are in with respect to the great distance in which they are situated from the Courts of Justice - It being near Eighty Miles for a considerable number of the inhabitant [sic] of the south part [of] said county to attend . . . notwithstanding which the county is most agreeably situated for a division & subdivision comprehending 14 town from south to north & seven from east to west . . . We your Humble Petitioners, beg your Honours would take us under your most serious consideration . 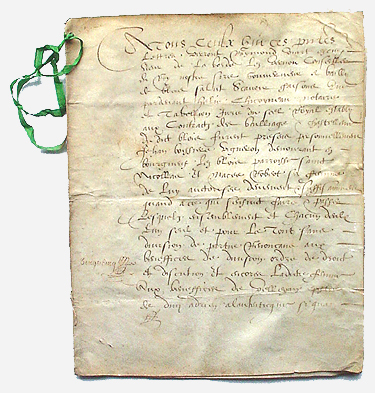 . .
FRENCH LEGAL DOCUMENT dated Tuesday, July 16, 1591. Two sheets of vellum folded to form  pp., each measuring approx. 12¼ X 10 inches. Seven full pages of text, plus three separate early dockets or notes on the back blank outer page. Very good; the leaves supple and strong; a bit of moderate staining but presentable, and still tied with the apparent original vellum cord strip. A small, fairly unobtrusive hole (perfectly round) appears to have been punched through the extreme upper left margin in modern times (through which a ca. nineteenth-century green ribbon is now tied). 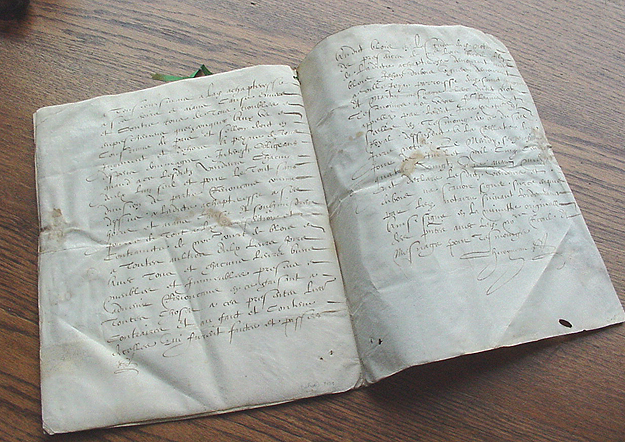 A sturdy and fairly attractive document written in a large, clear hand. I have studied this three times over recent years. Though nearly fluent in French of this period, however, I cannot read enough of the handwriting to decipher the place or names (conceivably one Raymond Delaborde, but don't depend on it). I find even the signature at the end unreadable. It appears to stipulate benefits, and mentions a wife. Written during the tenuous early part of the reign of Henry IV, pragmatic champion of Protestant rights. APPRENTICESHIP COLLECTION, primarily American, 1600s – 1910, with original indentures, documents, and interesting photographs & rare imprints. Formed over a period of some twenty-five years, this was a personal labor of love, now looking for a good home! CLICK HERE (Microsoft Word document, approx. 14 MB) to download my 62-page illustrated catalog of the collection, carefully described and arranged chronologically with preliminary essay and analysis of the contents. Unusual Catalog, on a very touchy subject: Onan Eschewed. DON'T DO IT! Or, YOU'LL GO BLIND: An unpretentious gathering of Books and Miscellaneous Ephemeral Productions calculated to EXPOSE, PREVENT, and generally WARN against the HORRID & DANGEROUS PRACTICE OF SELF– ABUSE. Together with an array of Enlightening Publications offering CERTAIN REMEDIES against the DISASTROUS EFFECTS of that ALARMING and DESTRUCTIVE HABIT. CLICK HERE (Illustrated .pdf, 16 MB).